Our last afternoon in New York came by all too quickly. 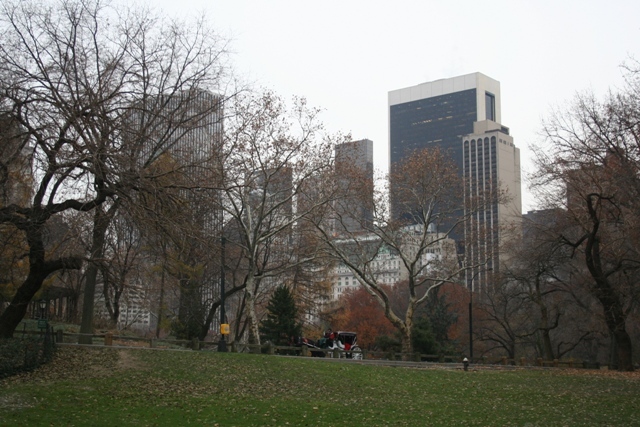 We decided to spend it in the green heart of the city – Central Park. This oasis of green in a wall of buildings, smack bang in the middle of Manhattan is a chance to escape from the insanity. Water, wooded paths and lawns, I had been before in summer time and remember joggers, skaters, musicians and lots of tourists. A bit different on a snowy Friday but no less impressive. We loved our stroll through the park – cold yes, but a proper winter wonderland. This was the first public park built in America and all the more impressive since it is surrounded by huge buildings. Designated a people’s park where everyone could come and enjoy it, now it attracts 15 million visitors every year and is ideal for people watching. 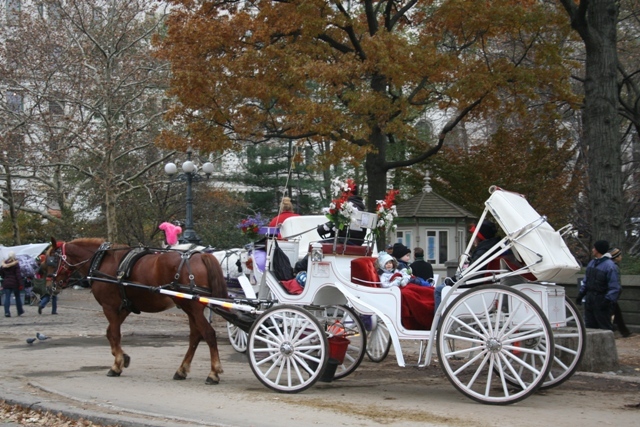 Our visit began with the quintessential Central Park experience – a horse drawn carriage ride. It had just started to snow when we climbed on board – this made an already fun experience a bit more magical. Not intentionally we chose a carriage with a roof – luck was on our side since this, together with the green, woolly blanket the driver threw over our laps, kept us snug, warm and dry. The ride lasted about 20 minutes, Son was super impressed, it was a wonderful and relaxing way to see the park. Our driver, of Irish origin, was pleasant, chatty and friendly. We lingered for a while at Artists Gate afterwards watching the horses drink from the stone troughs. Riding through the park was one thing but exploring on foot was also part of the plan. 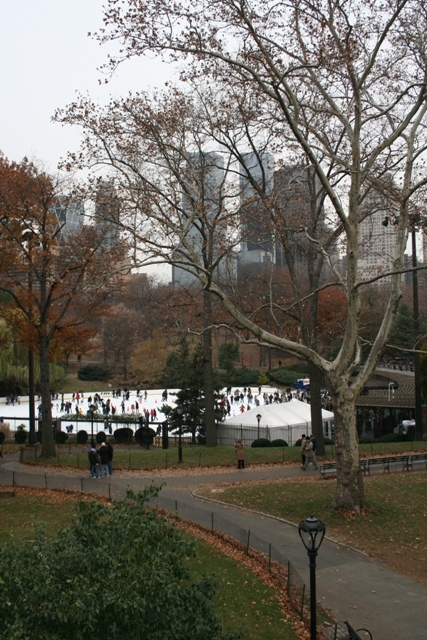 A gentle stroll along lovely paths and we found the Wollman Ice Skating Rink. Content to just watch – our skating skills are not up to much – the setting is gorgeous, between the trees with the tall buildings behind. The carousel was a lucky find – needless to say Son was keen to ride, so we did. 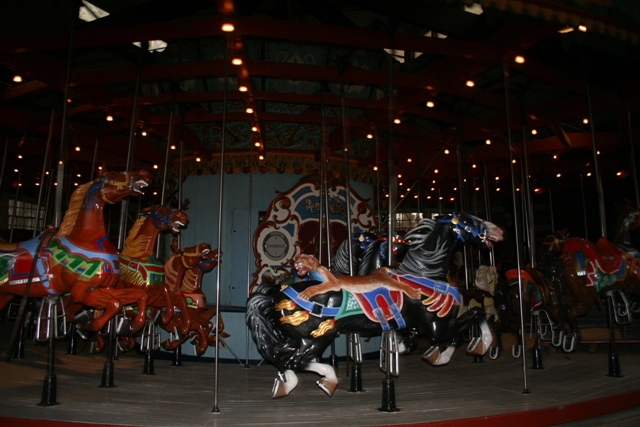 It has been in the park since 1871 and is open daily between April and December. There are 58 beautiful hand-carved horses but no-one else was riding. It soon became apparent why we had it all to ourselves. Icy cold already, whizzing around froze our faces and fingers. Incredibly uncomfortable, I think this is an experience better suited to warmer times. Playground time was next on the agenda – we found a great one at the Heckscher Playground. No end of swings, slides, climbing structures and a big sand pit. A stroll around Conservatory Water next with statues from children’s literature – Alice in Wonderland was our favourite. My regret was we didn’t make it to Strawberry Fields. Icy temperatures had gotten the better of us and we decided a warm cafe and thawing out time was essential. We were well wrapped up with multiple layers and heavy duty thermals and felt positively toasty elsewhere in Manhattan. The temperatures in Central Park seemed to take a dip – this combined with wind chill meant it was bracing to say the least. Despite the icy temperatures it was a wonderful way to spend our last afternoon in a wonderful city. New York we loved you and can’t wait to return. Was the horse-drawn carriage ride across the park expensive? I think it was about $50 – so definitely not cheap, but for us it was a one-off and we wanted to try it! Central Park is wonderful, isn’t it? It is an oasis of green and calm away from the noise and crowds of the streets. I was so cold and so icy that time but we did still enjoy it. I would love to go back again in summer and explore a lot more! Last February when we went to NYC it was deep in snow and my kids still played in the park. It was nice it was so quiet though as it can get quite bustly in the summer – in my minimal experience anyway. Thank you Rosemary – we loved the horse and carriage ride, like you say I saw it in so many movies it was top of my wish list! It didn’t disappoint and was the perfect way to spend our last afternoon in the city. Hope you have a great weekend too – take a break from the renovations!! Oh well, so many memories! I love Central Park! Me too – the perfect place to get away from all the hustle and bustle of the city!! Have a great weekend Erika. I have completely enjoyed your New York adventure…I have only been once, 25 years ago! I think I am due for another visit. Your family friendly approach is a great model – we will betowing our own little people along for our traditional “walking holiday” style, but it is inspiring to know that there is so much for them there too. Have a great weekend! We thought it was a great place – so family friendly, lots to see and do and very exciting for the children (not to mention the adults!!). Thanks for coming along with us on this adventure, hope your weekend is a good one too. I ride the carousel every visit to Central Park. It was a tradition that one of my very best friends and I had and I do it now in her memory. That must be a bitter-sweet thing to do, but lovely memories of riding it in times gone by. We had great fun on the carriage ride Pam – a bit chilly but having seen this in so many movies we just had to do it – it definitely did disappoint! Hope you have a lovely weekend! 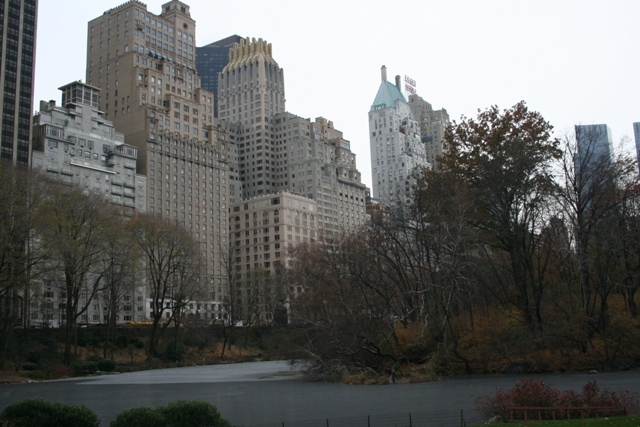 I love New York so have enjoyed reading about it – it makes me want to go again! We went to Strawberry Fields and it’s lovely, but it doesn’t take long to look at so I think with a small child you made a good decision not to take time out of the stuff he (and you) seem to have enjoyed so much. We all had such a lovely time in Central Park and enjoyed it so much, I think you are right Anabel – it probably was the right thing to do at the time. Hopefully this won’t be our last trip to New York though and we can see Strawberry Fields sometime!! Have a lovely weekend. 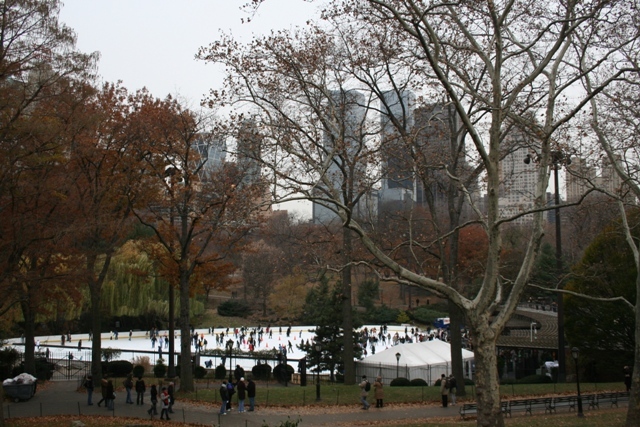 Central park looks also so busy during winter ! I’ve been during summer and it was a nice place to relax and chilled out. Would you like to visit during summer ? Would love to go in the summer time – I think the atmosphere would be completely different! It was so cold and icy when we were there, would be nice to feel the sunshine and sit around and people watch a bit! Have a great weekend. I’m very tempted to see it during winter, since I’ve been there during summer and it was so so different. Really busy, vibrant.. and a bit stressful. Seeing and visiting this town during both season must be great ! In Central Park! That’s an amazing spot too! Great post! Just looked it up – it looks beautiful and definitely somewhere to visit! Thank you for the great suggestion. Now just have to plan another NYC visit!! I’ve been THERE. May have told you I grew up in NYC. =) Lovely pix, take me back. Thanks Diana – what a great city to grow up in, must have been wonderful! Whatever we grow up with is our normal, right? I’m so glad not to be raising my boy there, though; kids grow up too fast. Central park is my favorite place in all New York. In winter its even better all coated in snow. We loved it there too Michael – would love to see it with lots of snow, would also love to see it in summer time too!! Central Park is truly a special spot in the city. I’m so glad you enjoyed your visit here and recommend two returns: one in the late spring when everything is lush and green and you can enjoy the zoo and in the fall because the autumn foliage will take your breath away. Both sound absolutely wonderful times to visit – thank you for the suggestions, they will definitely be going on “the list”!! Have a great weekend. Catching up on your posts has been a great reminder of our last visit to NYC. 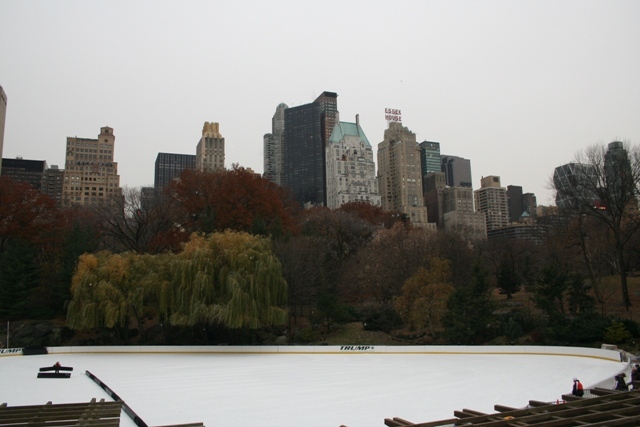 We were in Central Park just before the ice rink opened (year before last) – I would love to return to the city in winter. I loved our winter visit, having always been in summer/autumn it had a completely different atmosphere and I too would love to go back in winter. It’s gorgeous in winter – definitely recommend – just wrap up well!! We are super keen to go in summer though, again to see it differently. I very much enjoyed reading your New York posts. I, too, have one of those dreaded landmark birthdays coming up shortly after Christmas and not being a party person either, am also celebrating with a week in New York. I do hope it snows on our visit, too! That is the perfect way to celebrate a dreaded (or any other) birthday in my opinion!! I love New York in winter, the snow was the icing on the cake for us but even if it doesn’t, I’m sure you’ll have an amazing time!! Looking forward to reading about it.